Long before there was a hospital in Mandan, before there was a nursing school in the State of North Dakota, Anna Knox Stark served as able assist to her physican husband, but gained enough medical experience from his practice that this mother of seven provided medical services to the Glen Ullin and Mandan residents when he was unavailable. Anna Jane Knox was born on September 2, 1950 in Hartford Connecticut to Walter and Elizabeth Knox. 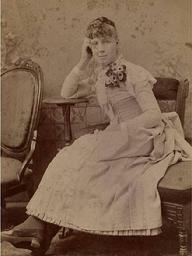 The family relocated to Milwaukee in 1867 when Anna was 17. Her future husband, George Stark Sr., moved there in 1872 after his graduation from medical school in Canada. They were married on October 16, 1878 and remained in Milwaukee until 1882. But an opportunity presented itself in Dakota Territory to provide medical services to Northern Pacific Railroad work crews and become the first medical doctor in Morton County. Their plan was to settle in Glen Ullin. While the city had been platted by the railroad, very few lots had been resold and none had standing buildings. 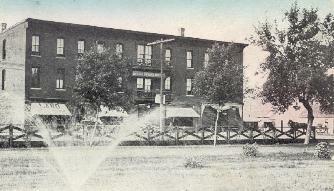 Dr. Stark opted to board his wife and infant son Carlisle initially at the InterOcean Hotel in Mandan. A railcar of lumber for a five room bungalow accompanied household furniture, chickens, a cow and a team of horses proceeded ahead. At the end of two weeks, the house was complete enough to the provide shelter so that Mrs. Stark could join her husband. Accustomed to the comforts and advantages of a large city, she made the adjustment common among the pioneer wives of her day. In the summer of the 1882, the Northern Pacific Railroad was under construction west of Mandan, with a large crew station at Glen Ullin. Mrs. Stark boarded this crew servicing meals to forty men each day. The Glen Ullin deport was also constructed that summer. All travel was by horse and buggy and Dr. Stark was away for days at a time. Anna had to look after the home, complete the chores with the livestock and sometimes patients were brought to town for treatment. Often cowboys with broken bones and little children who could not be given proper care at home were brought to town. During the sixteen years they lived in Glen Ullin, Mrs. Stark cared for hundreds of patients. The only disinfectant available at the time was carbolic acid and her hands were often sore and cracked from using it. Patients sufferend injuries that might easilly become infected, but none were lost through blood poisoning. In the fall of 1882, the couple filed on a claim two and a half miles south of Glen Ullin and built a log house and barn, moving the family onto the claim in the Spring of 1883. In the summer months, they lived on the claim where the doctor looked after the crops. Wheat and corn were grown, but the high-grade potatoes were most profitable, suppling them to the Northern Pacific Railroad for their dining cars. Mrs. Stark owned the homestead with a clear title as it was presented to them by the government. Five children were born to Dr. and Mrs. Stark while they lived at Glen Ullin. Carlisle was born before they left Wisconsin. Dawson Stark was born after they moved to Mandan. 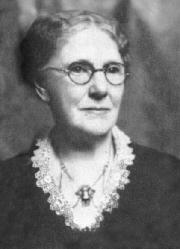 Daughter Mary Stark would devote her life to educating children of the Mandan School district. George would settle in Mandan while his sister Elsie would eventually move to New York City. Dr. Stark had been working in cooperation with Dr. Reid in Mandan during most of the years the Starks had resided in Glen Ullin. When Dr. Reid died in 1900, the couple took the opportunity to move to Mandan, enroll their children in a larger school system and take over Reid's established medical practice. They purchased the home at 201 3rd Ave NW, built in 1879, and believed to be one of the first homes in the city. In 1913, Dr. Stark suffered a slight stroke but continued to practice, In 1915, he suffered a second stroke and died less than a week later on May 6. Mrs. Stark, with her children almost full grown, turned to involvement in civic affairs. For a time, she was the oldest woman in the state to hold an elected office as a member of the Mandan Park Board. Over her ten-year tenure, she was responsbile for the establishment of several parks within Mandan including the Civic Memorial Park (location of current Mandan post office which was formerly a dump site). With her focus on city beautification, she also helped to organize the Civic Improvement League, serving as its President for the first 23 years of its existance, and subsequent multiple terms on its Board of Directors. She was also very active in the State Chapter of the "War Mothers" including serving in several officer roles. She was also Past Worthy Matron of the Eastern Star. Anna Stark died on October 6, 1944 at the age of ninety-four and is buried in Union Cemetery beside her husband, daughter Mary, son George Jr. and his wife.